The Delaware Valley felt the impact of a major snowstorm on February 23, 1987. PHILADELPHIA (WPVI) -- The forecast for Philadelphia for Thursday, Feb. 23, 2017, is partly sunny, warm and 70 degrees. Thirty years ago was a totally different story. 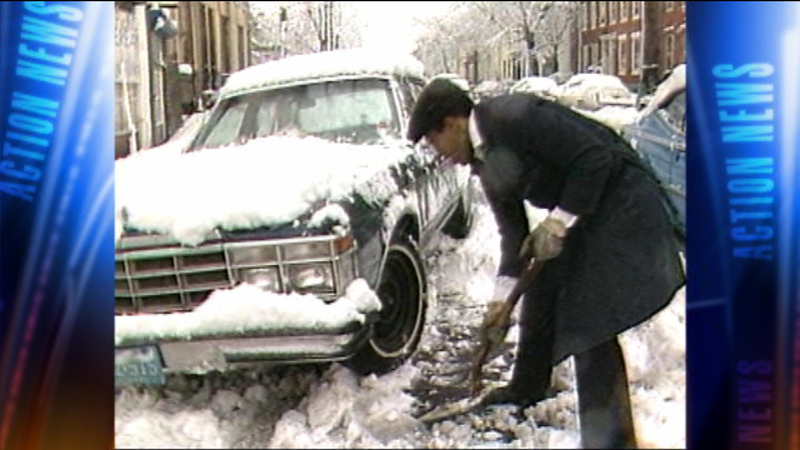 Back on Monday, Feb. 23, 1987, the Delaware Valley was hit with a strong snowstorm. The Action Cam was all over the area capturing images of the snow. Today, the Action Cam is getting images of the sunshine. According to the National Weather Service, during the height of the 1987 storm, Philadelphia received 5 inches of snow in just one hour. Their records show 24 inches fell in Lancaster County and 23 inches in Coatesville, Chester County. Action News reporter Nora Muchanic interviewed Garden State residents who were digging out their cars. Nora Muchanic reports on the Blizzard of 1987. Nora reported 14 inches of snow fell in Trenton. In Philadelphia, Action News reporter John Rawlins spoke to those in Center City who still made their way to work despite the snow. John Rawlins reports on the Blizzard of 1987. This snowstorm is a throwback that fans of warm weather would probably like to leave in the past.